Music is the language of emotion and is held in great esteem as the finest among the fine arts. Right from the dawn of human history, music pervaded in the blood of every individual and has become an integral vibration in the country's culture and civilization. Our country has its peculiar genius effected in the music with its richness, exemplary character, innumerable literature that speak about the art, the astounding variety of musical instruments, galaxy galore of musicians, a cascade of vaggeyakaras the repertoire with items each unique in character and so on. By the production of these in this soil our country has won quite a significant position among the cultures around the globe. The thread like flow of music is incessant, without any break, through the composers, the creators and the musicians - the distributors. The felicity with which the same individual writes both the lyric (sahitya) and the music (tune) is an amazing creative faculty, not so easily found anywhere else. 'Sangeeta' means not only vocal and instrumental music, but, includes dancing also, within its compass. These three arts, also called 'Touryatrikam', have an equal share in the constitution of Sangeeta, in a broader perspective. But dancing, above all, was considered as the foremost, for it has vocal and instrumental music as its limbs. Hence it gained more prominence and importance, while the other two only as supporting elements. Most of the earlier works on music, deal mainly about 'dance' and, sometimes, 'dramaturgy', and about music, only as a part of natya. The very title 'Natya Sastra' said to be the earliest work on dramaturgy, bears a kin relationship to dancing, at least to some extent. The word 'Bharata' itself is used as something connected with dancing, while it also acts as a contraction for 'Bharatanatya'. But, in fact, the term 'Natya' does not mean 'dance' only. On the other hand, it connotes Nrutta (pure dance) Nrutya (interpretative dance) and the dramatic representation, all in one. Still, 'Natya Sastra' is the earliest available text to provide us the richest source of information on dance and matters pertaining to it. More works such as 'Abhinaya Darpanam', 'Bharatarnava', Nrutta Ratnavali', Hasta Muktavali', 'Abhinaya Lakshanam' and 'Natya Vedagama' appeared. Only later, music (Vocal and instrumental) usurped the place of dancing and we were handed down, a number of works on music, but alloting a section or two to dancing also, at the end. Artistically a confrontation between music and dance took place and continued for centuries. Dancing (nrutya) has ever since been considered as a bewitching art, which is more communicative than anything else. Sometimes, even words are also of no purpose. A dancer could very easily communicate, have a dialogue devoid of words or narrate a story, simply with the help of Abhinaya (mukhabhava) and hand gestures (Hasta Visesha). Lord Siva is worshipped as Nataraja, the king of dancers, while many other gods and Goddesses of the Hindu Pantheon are also represented in dancing chiselled out as beautiful sculptures, found aplenty in the South Indian temples. This enthralling art of dancing is a natural species which finds union with its genus - the ultimate. It is a universal phenomenon, prevailing in all climes and times. The purpose of this art is quite evident. Very easily it helps the artiste, as well as, the spectator to reach higher planes of bliss. It produces a 'rasa bhava' or aesthetic experience. It is not merely a thing to be seen as an entertainment and enjoyed, but the finest art worthy of reverence and understanding. Always it served as a feast to both the eye and the ear, in common parlance. Soaked in Lakshana and lakshya that are brimful in Indian dance, particularly in Bharatanatya, hundreds of compositions have been carved out for the exclusive use in dancing. 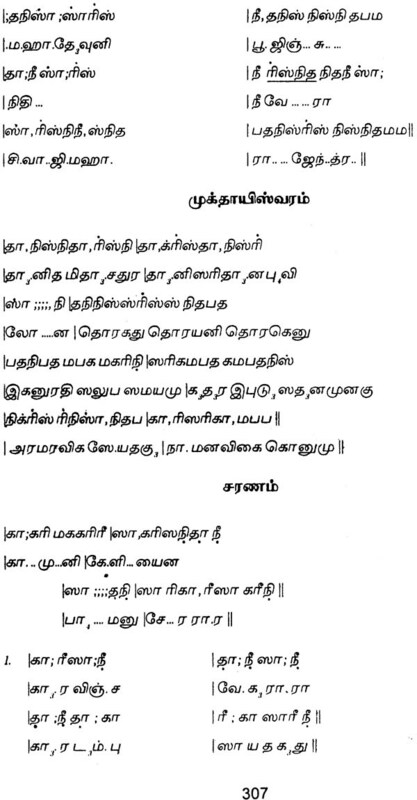 'Natya Sastra; mentions 'Dhruva' and 'Geeti' ('Dhruva' means 'Pallavi' -constant and 'Geeti' means variant in the lyrics) two important items of those times, while, Magadhi, Ardhamagadhi, Sambhavita and Pruthula are the four kinds of Geetis. 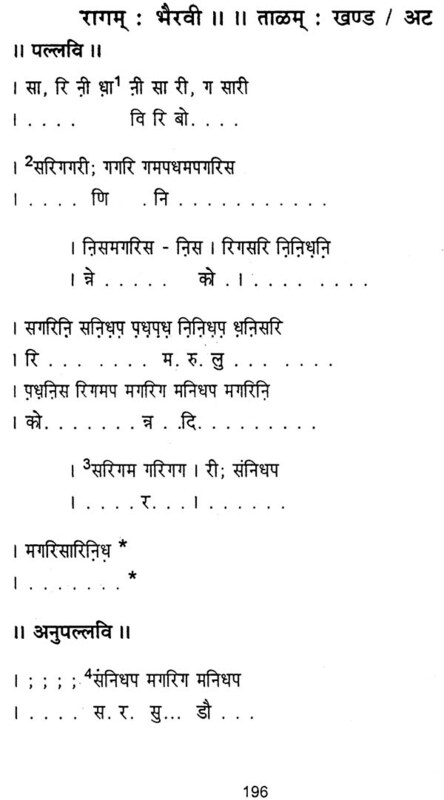 While listing the Desi Prabandhas, Matanga, one of the very early writers on music, puts its number as fortynine and later; Sarangadeva gave it as seventy five. The Lakshana of a Prabandha (a variety of composition) is that it should have six angas: Svara, Pada, Biruda, Tenaka, Patha and Tala. Whatever be the case, we are almost in the dark with regard to the items that were used in dancing, during the Chola period. Later, items like Daru, Jakkini, Desi, Chaupada, DandaJasya, Gujjari, Perani, Dhruvapa:da Kelika and so on were in the repertoire of dancers during the times of King Raghunatha Nayaka and his son, Vijayaraghava Nayaka (of the Seventeenth century) as vividly extolled in Chengalva Kala Kavi's 'Rajagopala Vilasamu' and Vijayaraghava's 'Raghunatha Nayakabhyu dayamu'. Most of them lost currency during the next period of the Marathas, giving way to new forms and items. The advent of the Tanjavur Quartette - Chinnayya, Ponnayya, Sivanandam and Vadivelu (about whom, we shall see later) marks a new era in the history of Bharatanatya. The pattern of the present day dance recitals was systematised and introduced by these brothers. For this purpose, they composed a large number of composititons, which serve as the backbone of the dance recitals of the present day. As devised by them, the repertoire consists of Melaprapti, Alarippu, Jatisvara, Sabda, Varna, Tillana, Padas etc. Melaprapti and Pushpanjali are the commencing items, but the former is now almost defunct. Before 'Varna' occupied the place, 'Svarajati' played the important role. This ingenious systematisation evinced favourable response among their contemporary natyacharyas, who assimilated these items for their own use and presentation. Since the present work contains varnas and Svarajatis, besides few other items, suffice it to see about these two forms here. Svarajatis are of two kinds: - One serving as a vocalise and the other used in dancing. 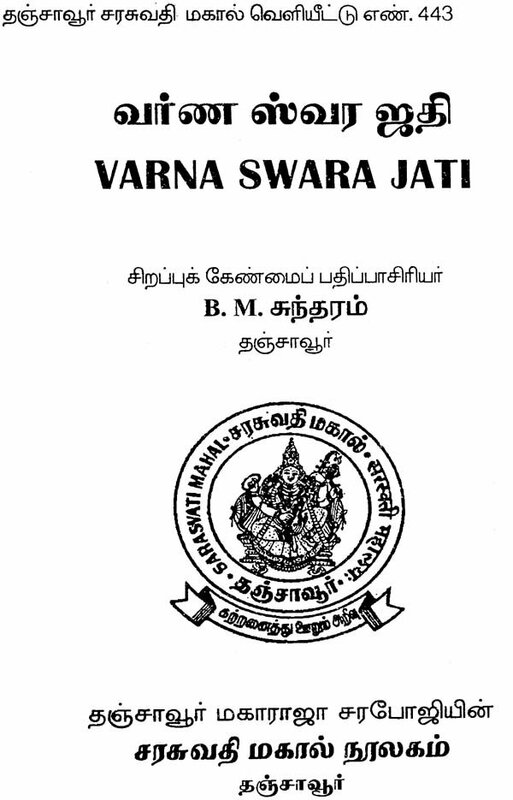 The Svarajati used as a vocalise may be treated as a stepping stone to learn the Varna (Tanavarna) after the practice of Svaravali, Janta Varsai, Dhatu Varsai, Alankara and Geetas. Similar to a kruti, the Svarajati has a Pallavi, Anupallavi and one or (mostly) more charanas. Some of them may not have the anupallavi, as we find in the structure of a keertana with Samashti Charana. The theme of the song may be either devotional, heroic or amorous. Since a passage of Jatis (rhythmic solfeg gio) was originally an integral part, this composition rightly acquired the name 'svarajati'. It contains svara (a musical tone), jati and Padas (words). Some of the Svarajatis that are available today do not contain jatis, but still retain the same name. The second type of Svarajati is that, which we are now concerned about. It was used in dancing, until Padavarna replaced it. It adheres to a great extent, to the lakshana of Prabandha consisting of Svara (musical note), Biruda (small word used for exclamation, such as 'O' and 'Ha'), Pada (lyric), Patha (rhythmic solfa syllable) and Tala (rhythmic structure). Only 'Tenaka' (words like 'Tana Tana') is missing. The structure of a svarajati is almost akin to the Padavania. Pallavai, Anupallavi, Muktayisvara (some call this 'Chittaisvara', Ettugada (also called 'Charanam ') and ettugada svaras, with lyrics for all these. The only distinction between the Svarajati and the padavarna is that the former is inter spersed with Jatis, which is absent in the latter. Before going into this subject in detail, we shall first see about the Varnas, in general and Padavarnas in particular.